This article is going to be about how I ended my relationship with DirecTV and why I consciously chose to pay $230 now in early termination fees to save thousands of dollars later. When I first signed up for DirecTV, I was super excited. They had this huge promotion which gave out hundreds of HD channels for only $29.99 when the original price was $61.99. They were also throwing in free professional installation, free handling and delivery, no startup costs and no equipment to buy. Wow. Sounds great right? My friend told me about DirecTV's refer-a-friend offer, and when my friend referred me, we both got an extra $10 off my bill each month Sweet! At the time, I didn't care how the numbers added up. With all their random discounts and promotions, I was paying $31.99 a month after tax and getting 210 channels. And I was okay with that. Problem was... I never really watched all that much television. I get all of my news online and on public radio. I watch Netflix every now and then for the streaming movies and television shows. I rarely watch sports, and when I do, it's at a sports bar or at a friend's house. In fact, I was only watching no more than 5 to 7 hours of DirecTV a week. 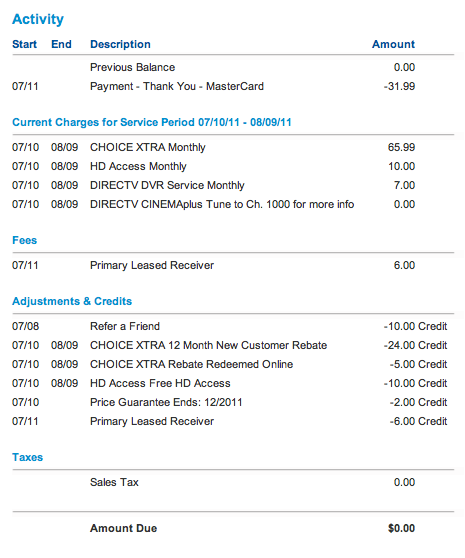 10 months after starting DirecTV, my bill turned from $31.99 to $41.99. This was when I called in and found out that my $10 referral credit had expired, and if I wanted more discounts, I would have to refer more people to getting DirecTV. I was also nicely informed that in 2 months (my one year anniversary), I would be losing the promotional $24 rebate, and the promotional $2 random rebate, and my bill would now permanently be $67.99 each month. "Sorry the promotional pricing is only eligible for 12 months and you have a contract for 24 months." 2 year contract?!? They got me... I was in such a hurry to sign up to get all these sweet HD channels and movie channels with video recording that I didn't read the fine print that committed me to a 2 year relationship with DirecTV. Take that $815.88 cost of one year service x 5 years = $4079.40 per 5 years for a service that I didn't even really use. Take this $67.99 a month fee and compound it over 10 years and I will have saved over $10,000 in wasteful spending. I knew exactly what I had to do. I paid the early termination pro-rated fee of $230. Ouch. $230 is kind of a lot of money. But I consciously did the math. And it was worth it. After paying $230 up front, around 3 months and 12 days worth of paying for a service that I don't use, and I will have saved $815.88 - $230 = $585.88 for the rest of the year. A year free from the tyranny of DirecTV. Oh yea, and not to mention this will save me over $4000 over the next 5 years. The DVR unit is going into the prepaid box and out of my life! This brings me to my solution for getting quality programming movies and television shows. The Roku 2. The Roku 2 has been my way of saying "screw you, DirecTV." It was one of my wishlist gifts this past Christmas that my good friend K. bought for me. 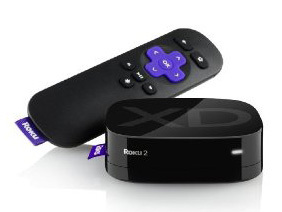 The Roku 2 is a tiny media streaming box that connects wirelessly to 350 channels featuring: Netflix, Hulu Plus, HBO Go, Crackle and Amazon Instant Video. It connects to almost every TV via A/V cable or HDMI cable and streams HD up to 1080p resolution. There's even a free iphone Roku app that allows me to use my iphone as a remote to control the TV. This puppy provides tons of free content, including news and movies; if I am really itching to watch a movie that is not offered for free, I can rent it on Amazon for $0.99 to $4.99 per movie. Seriously, it's incredible. I truly feel liberated and freed from the shackles of DirecTV. I enjoy my Roku 2 so much, I even bought my mom one. Note: If you're a big sports fan and love to stay at home watching sports by yourself, the Roku 2 probably isn't for you. 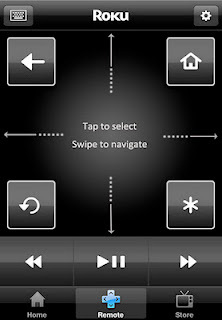 If you enjoy watching television series and movies on TV, and don't mind watching sports at your friend's home or at the sports bar, follow in my steps. "This year, the programming costs we pay to owners of TV channels will increase about 10%, but we have chosen to adjust the prices our customers pay by an average of only 4%. New prices take effect February 9, 2012 and will appear on billing statements issued after that date." Looks like most programming packages will see $3 to $5 a month increases, while DVR rental rates are expected to increase anywhere from $1 to $8 a month. I did a google search, and it seems like DirecTV has started increasing fees steadily every year since 2008. I am even more happy I made the decision to end my contract. Update 1-30-12: I was wondering why the DirecTV satellite was still on my roof. I called customer service, who nicely told me "You can keep keep the satellite, we don't want it." Yes that's right. Now that my service is cancelled, they refuse to come pick up the dish. I need to remove it myself. Ridiculous.